Panel – Brian Norton, Josh Anderson, Belva Smith, and Wade Wingler – Q1- Accessibility in Canvas Q2- Deaf/HOH communication Q3- Notetaking options for Blind and Visually Impaired – Q4- Classroom tools for persons with limited mobility Q5- Wildcard question: What are you doing with all your old pictures? BRIAN NORTON: Hello and welcome to ATFAQ episode 84. My name is Brian Norton I’m the host of ATFAQ. We are so happy that you’ve taken some time to tune into us this week. But before we jump into the questions that we have, I wanted to take a moment and go around and introduce the folks that are in the studio with me. First off is Belva Smith. Belva is the vision team lead here at Easter Seals Crossroads. You want to say hey to everybody? BRIAN NORTON: We also have Josh Anderson, the manager of clinical assistive technology here at Easter Seals Crossroads. Josh? JOSH ANDERSON: Thanks for listening everybody. BRIAN NORTON: And also Wade Wingler, the VP here at Easter Seals Crossroads. You want to say hey? WADE WINGLER: You guys were supposed to jump in. JOSH ANDERSON: A little off key. BELVA SMITH: I think it was funny that he was about to call you Belva. BRIAN NORTON: It almost slipped out. That’s just my stalling as I think about what I want to say. For new listeners, I want to take a moment to talk about our show to let you know what you’re going to get into today. 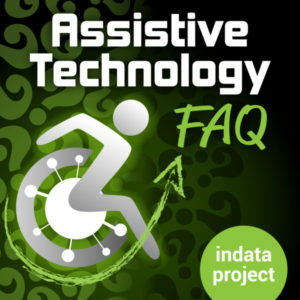 How our show works is we look for feedback and come across various assistive technology questions throughout the week. We turn that into a show, so we set around in a panel format and try to give our best shot at answering the question that you guys have. We also look for feedback, so as we have questions today, if you guys have feedback or have answers of your own and you want to share that with us, we would love to hear from you, not only your questions but feedback as well. You can give us a call on our listener line set up at 317-721-7124. We also have an email address at tech@EasterSealsCrossroads.org. Or we also have set up a hashtag as well, hashtag ATFAQ, so you can send us a tweet with the question or feedback. We go ahead and get of those up and put them on our next show. Just a couple of different ways to be able to get in touch with us. The other thing we want folks to know is you can find us in a variety of places. If you are looking for our show and want to share with your friends, you can send folks to places like iTunes, ATFAQshow.com. You can find us on stitcher, Google play store and a variety of other places. Share the news, share our podcast. We love new listeners so do that in those different ways. Without further ado, we’re going to jump in today. We have quite a few questions and things to get through today. The first couple of things we’re going to do are some voicemails that came in. We are going to go ahead and play those. The first is some feedback from Ron in Northwest Pennsylvania. In our last episode, we talked about food in our wildcard question, and he wanted to chime in and mention a new wave of and that he has and how much he loves it. We will play that for everybody so let’s take a listen. SPEAKER: Hey guys, Ron from Northwest Pennsylvania once again. You guys were talking about food. I use the new wave portable of an, which is beautiful. It’s got a calculator/telephone keypad. It’s spelled N-U-W-A-V-E, Nuwave Oven. I believe the webpage is simply www.nuwaveoven.com. Don’t quote me on that, but if you do a search for it, you’ll find it. And then I use my microwave, and once in a blue moon I’m still borrowing my cousins George Foreman grill, which is okay but I like the Nuwave better. There you have it. Catch you later. BRIAN NORTON: Thank you for chiming in and talking about the Nuwave, N-U-W-A-V-E it sounds like that’s a pretty cool oven and an option for some folks that may want to look into that. Thank you for that. I appreciate it. We are going to jump into our second bit of feedback today. This is a comment that came in over our voicemail. A couple of episodes ago, Wade throughout a term called Kobayashi Maru. We all were like, we’ve heard that term but we don’t know quite exactly what it is. We got a little bit of kudos from one of our listeners. WADE WINGLER: Somebody showing their nerd credit. BRIAN NORTON: That’s right. We are going to play that, and he also has a question tied into it as well talking about the accessibility in canvas, which is an online learning management system. Will play that as well. SPEAKER: This question is for the ATFAQ show. First of all, thank you Wade for trying to educate the other people on the panel. Kobayashi Maru is something they should know all about. Live long and prosper. Secondly, I have a question relative to online learning management systems. I am an adjunct instructor at a local University. I am legally blind. We had just gone to canvas LMS. Our department chair would like instructors to utilize the technology more, even those of us who are teaching in a traditional classroom setting. She would like us to be more innovative and technology driven in our classrooms. I looked at several list serves, but no one seems to have an answer for me. I thought I would give the question to you guys of what might be out there to make canvas more accessible for visually impaired instructors specifically. I know there are a lot of questions about student as well that I have found online, but I thought I would throw that to you and see what you guys might be able to come up with. One of the difficulties is with using screen readers and so forth, all of the various menus and things, there’s just so much information on screen that the technology we have today has a hard time presenting that to a low vision or blind user in a meaningful way. It’s just a problem getting the two technology to handshake. I look forward to hearing you guys on the next episode. Thanks. BRIAN NORTON: He brought up Kobayashi Maru. Wade, I’m going to throw that out to you first so you can educate not only us — because you’ve already done that Dutch but other folks you minute know the term. WADE WINGLER: I made that up. BRIAN NORTON: You know he’s got one at home. WADE WINGLER: I do have some taking the manuals for some of the Star Trek stuff. At any rate, there was a simulator in Starfleet Academy that a young James Tiberius Kirk was submitted to. It was called the Kobayashi Maru, and it was an unwinnable battle scene. The thing was called the Kobayashi Maru. Jim Kirk was the only one who ever won the Kobayashi Maru or was able to pass the assignment in Starfleet Academy because he cheated. Most of the captains who were being trained would go through. The thing is the Kobayashi Maru is destroyed in this battle scenario, but he snuck in to the simulator and reprogrammed it so that it would allow him to win and only he would be able to put in some code and when. That was one of the things that made Captain Kirk a cool guy, because he knew he was being put into an unwinnable solution so he punked them. BRIAN NORTON: So isn’t it cheaters never prosper? It turned my mom used to use. Cheaters never prosper. WADE WINGLER: It’s a live long and prosper. You have to start by living long. BRIAN NORTON: That’s the whole thing. Isn’t that different? Live long and prosper, cheaters never prosper. WADE WINGLER: We are not saying he is a man of high moral standards. Have you watched the show? There are a lot of green ladies in his life. We don’t think of Captain Kirk as a puller of society. We think of them as somebody who wins. That’s what that is all about, or at least that’s my recollection. Know if there are any Trekkies out there who are saying you got part of that wrong, please tell me. I want to hear from you guys about this. When we get into canvas, that’s part of my world. I’m an adjunct professor for a couple of universities and I teach courses that deal with accessibility and assistive technology and stuff like that. To our callers question, I don’t rely on a screen reader. I have some screen reader skills I don’t rely on it for my access. I’m a Mac user family at this point, so I have run through canvas with voiceover pretty extensively and I found the accessibility to be pretty good, especially from the student side of it. But here’s the thing about canvas — and I’m finding this to be true with blackboard and LMS more — the instructor side doesn’t look a whole lot different. More and more, the LMS looks like the LMS. On a couple of the ones I use, you turn on editing mode or turn on instructor mode, and you are still dealing with the student you for what you are doing. You inherit the accessibility that has been intentionally built into the student to view. There is just a few extra fields that you are dealing with. Now the thing about canvas is it’s like any other platform. There are a bazillion plug-ins. You can put in videoconferencing and simulations. Like any LMS or any operating system or platform, you can put some in accessible stuff in there and break it. You can put an untagged PDF in there, or you can put images that are inaccessible. Or you can pop scripting that is inaccessible. My experience has been, both from the student perspective and instructor perspective, it is pretty accessible until you get into those third-party uncommon nooks and crannies where you’re using a plug-in or something else. Obviously your mileage is going to very and there could be exceptions, but I like canvas a lot. Of all the LMS’s I use — I’m not being paid to endorse any of them and there are some I like to bellyache about. But of all the ones I use, it’s my favorite because it is intuitive, accessible, and the student you and instructor view are pretty similar. That also helps me from an instructor perspective because when the student says I’m having trouble, and they describe what they are seeing on the screen, I’m seeing the same thing, so we’re looking at it through the same lines. And if I need to change something, I sort of switch into editing mode which allows me to change things. But when I’m developing course material, I’m looking at what the student is going to see and developing what the student is going to interact with. Then again, we always go back to are instructors developing accessible content within it. BRIAN NORTON: I think that’s where you’re going to find most of the pitfalls with that. Like you said, all of those third-party things, the document you upload, the video to upload, if they are not accessible — canvas can only handle itself. It can’t really account for the accessibility of the other things you bring in. BELVA SMITH: The website found, Brian, I think you’ll to have it listed. KB.iu.edu? BELVA SMITH: Which is creating accessible content for canvas. It looks like it is very informative site. It goes down to how to create the digital resource and make it more accessible, the general accessibility guidelines – and I think this was really designed for the instructor to make sure that what they are putting out there is accessible. BRIAN NORTON: We are the assistive technology act here in Indiana, so we’ve got some friends at IU. Like you said, Belva, the website is KB.iu.edu. It’s got a bunch of other things. If you look for canvas content — you look for create accessible canvas sites. It’s got a lot of great information about making rich content for folks but also making it accessible. That might be a great place to turn to and look for sure. WADE WINGLER: Canvas has a site, CanvasLMS.com/accessibility is their site to help with that stuff. BRIAN NORTON: I don’t know if we have any listeners who may have a visual impairment or use accessibility or you some sort of accessible software to be up to get access to that and create their own sites. If we do, we would love to hear from you as you guys create your content. If there is any tips or tricks or ways to make the content more accessible, we would love to know that and be able to share that with the caller. You can give us a call on our listener line at 317-721-7124. Or you can send us an email at tech@EasterSealsCrossroads.org. We love to be able to try to do our best answers for things couple we know you guys use the software and this technology as well and we want to give you guys an opportunity to chime in as well. Take advantage of that and we would love to hear from you. BRIAN NORTON: Our next question is, I’m looking for something that would help family members communicate with their adult daughter who has suddenly and unexpectedly lost her hearing. They are currently using a whiteboard or computer, both of which are cumbersome. Any suggestions would be appreciated. I’m discussing here, but either I’m thinking they are using the whiteboard and passing it back with each other or using a laptop and writing a what they want to say and she’s done writing out what she wants to say, and they’re going back and forth. To be honest with you, I’ve done that before in a pinch. It’s not very efficient, not very productive. Looking for something that can make that less cumbersome for them. JOSH ANDERSON: What I’ve used with a lot of folks — and I work with a lot of our folks who are deaf or hard of hearing. Sometimes the interpreter doesn’t show up for the person doesn’t know Simon of it or they are late. I use Microsoft translate a lot. You can put it on and I was phone, Android phone, computer, Mac, any of them. I think you can open it up as a website. If you both have a device, you can start a conversation. They can either scan the QR code or type in a little thing, and you can talk back and forth. If I am the hearing individual, I can just talk into the device and have a come across. If I’m deaf and can’t communicate verbally, I can type it in and it will show up in another bubble. It’s completely free to use. It’s actually made to translate, so really you just have to make sure that you make it go English to English so that it will have everything come up that way. BRIAN NORTON: The primary use is a foreign language translator? JOSH ANDERSON: The primary use is foreign language. Wade, you will be excited. I believe it has Klingon. I believe they have added that on. It works really well. It uses artificial intelligence to do everything, but it is a really good job. As I said, you can put it on any device. It’s essentially a website you open, if you’re on a computer; if you’re on a phone, you just download the app. My other question is I wonder if it could be even easier, since the daughter has just suddenly and unexpectedly lost her hearing, if she still able to communicate verbally, that and really speeds things up because one person can just talking to the device, have the word show up, and it can respond. BELVA SMITH: So she could verbally respond as well? JOSH ANDERSON: Maybe. It doesn’t say I’m guessing that would be one way to be able to do it. It works pretty well, like I said. Then you have your own devices. You are not handing things back and forth. BELVA SMITH: I also just talk about the device we have that’s the Ubi Duo. That’s two devices. I’m sure they are going to find it to be cumbersome. Then they both had to have a device in their hand or be sitting at the same table. That’s essentially a device that allows you to have a conversation back and forth, typing information, and then it’s displayed on a screen. Maybe that’s something that they could borrow from the lending library. If they are here in Indiana, they could certainly borrow it from us. If not, they could find out where their local one is. I’m wondering if they know if this is a temporary thing or if it’s going to be long-term. Obviously if it’s going to be long-term, then they probably want to start looking into learning ASL. BRIAN NORTON: American Sign Language. I think in all scenarios, the person who is deaf or hard of hearing at this point is going to have to type out the answers. I don’t think there’s anything that will help other than maybe a picture-based system that can get things out on page a little faster. I think of all the solutions we talked about so far, you are going to have to be able to type back and forth. Ubi Duo does that; Microsoft Translator does that. There are a couple of other apps that — I wouldn’t say they are Microsoft Translator-esque, but you may also look at AVA. Ava is iOS or Android accessible, or a live caption app. Live caption works on iOS. It’s similar stuff to what Microsoft translator does, but it will allow you to do small-group conversations or big group conversations where everybody logs in. Everybody has a mobile device or smart device in front of them. As they log into the system, it’s a little bit like doing go to meeting or an online meeting where everybody is named as they join the meeting. But every time they say something, their device picked it up and posted in a virtual chat room with their name attached to it, so that the person who is hard of hearing can fall the conversation around. JOSH ANDERSON: It reminds me of a group text. JOSH ANDERSON: It makes it a lot easier so you know who is talking at the table and all that. It can work really well. BELVA SMITH: Thinking of a daily environment, that would be something that you get up in the morning and login and keep yourself logged in throughout the day? BRIAN NORTON: I think it’s more for when you go to a meeting. Like going to work, we are in this meeting, we could logged into this device. Every time you would say something, it would pop up on my device in front of me, and I could fall the conversation. I think that’s really hard for folks who are hard of hearing, following conversations in small group, large group settings. Knowing what was going to talk, especially if they are not making gestures or raising their hand before they speak, those kinds of things. I think that’s made specifically for those types of settings. BELVA SMITH: That’s what I was picturing it as, more than just having family chatter throughout the day. Are you hungry now? Do you want to go shopping now? But I do like one of the things I’ve seen that you had mentioned, Brian, was a big note. Is that the same as Big? BRIAN NORTON: Yes. That’s the icon you will get on your device. It’s called big note, but that’s the icon you’ll get. BELVA SMITH: That’s pretty simple if you guys have a tablet. You could use an iPhone or iPod if you happen to have the iPod touch. You can type on that. Because we don’t have vision difficulty, we don’t have to worry about how big it is. It’s just a simple, clean app that allows you to type back and forth. I don’t think you can dictate into it though. I think it has to be typed if I’m not mistaken. BRIAN NORTON: I think you can still dictate into it. JOSH ANDERSON: As long as it’s iOS. As long as the icon comes up, you should be able to. BRIAN NORTON: I’ve got several deaf or hard of hearing folks that use that type of app. The other one similar to app is made by Sorenson, which they do a lot of that video relay stuff for folks. They have one called Buzz Cards. What’s great about those is you can create little text messages, personal text messages. So if you get the same question all the time, you can have responses. If you’re going into Starbucks and ordering your coffee, instead of having to write that out every time, you just say that and show them the card that you want which tells them the type of coffee. I don’t go to Starbucks so I don’t know all of the variations of what your coffee would look like. JOSH ANDERSON: They don’t serve Diet Coke? BRIAN NORTON: They don’t serve Diet Coke. BELVA SMITH: The Buzz Cards would be a pretty good one for this situation since we are talking about the Family committee getting back and forth, because I’m sure that they could come up with a whole stack of just generic cards that, instead of typing the same thing over and over, they are just pulling up the car they want to use. I also wanted to mention to this particular question, the CapTel phone which is available. I know they weren’t asking for phone access, but in case they are in need of phone access, the CapTel phones are typically free for persons who are hearing impaired or deaf. The way they work is the caller’s information is actually translated onto a small screen, so than the person who is hard of hearing or deaf can read information that’s been spoken to them, and then they can speak back. If you go to captel.com, you can get more information about that. BRIAN NORTON: Those are great phone systems. Not only will they caption them, but if it’s just hard of hearing, you can amplify a lot of times with those phones. On the thing out there out, we have something called the depot here at the INDATA Project. We churn out used computers. We wipe them clean, we load a fresh copy of Windows and office on them, and we give them away to folks throughout Indiana who have a disability. We had a volunteer coming in, and she was hard of hearing. We use of the called a boogie board. Have you guys heard of the video board before? Smith like I haven’t used it but I have heard of it. BRIAN NORTON: It’s a little bit like an Etch-a-Sketch but with a pen. The boogie boards are cool. It’s a little bit like passing the whiteboard around that they currently do. But what you do is you get a pen, you can just write your message really quick and pass over to them. They can erase what on the board just with the push of a button, rewrite their message, you read it. You can push the button and get rid of their message. He goes back and forth really quickly like that. It’s really simple. BELVA SMITH: I’m not telling the truth when I say I haven’t use one of them. I actually have one of those for my grandkids. They come with templates so that you can learn to write your numbers. It works exactly like you said. It’s kind of a tinted blue screen, and you just use that special pencil to write on it and push the button and it’s gone. WADE WINGLER: My kids love that thing. BRIAN NORTON: We used that in our depot for quite a while, and it worked pretty well. It was a little cumbersome, but provided a little less passing back and forth. The racing was a lot easier and set of filling up the whiteboard like that. Something to think about. Will mentioned it. I think I mentioned that just briefly. The live caption app. We talk about Ava which is for really group settings. A live caption app is a one on one app. If you’re having a one-on-one conversation, you just set your phone out and part of everybody, and every thing that is being said is being transcribed. At least for the person who is speaking, their stuff will be written out in text’s that the other person can read it. Then she can also jump in a type stuff as well just to get communication going back and forth, so just a couple of options. I don’t necessarily know — there is not necessarily great technology at this point turning ASL or American sign language into text, although they are getting into that a little bit. WADE WINGLER: There’s stuff happening. Microsoft Kinect technology has really changed the ability to capture movement in a meaningful way. You are always going to have the issue of it’s not a one to one in dialectic things happening with sign language, but there is some progress being made. BRIAN NORTON: Yeah, you’ll hear about gloves that you can sign with the glove on and it’s going to turn it into text. But again it’s in its infancy. I want to make sure that I give the opportunity for folks who are listening to kind of chime in on this as well. If you are familiar with an app that maybe we didn’t mention already for a device that we didn’t mention, we would love to hear from you. You can send those to tech@EasterSealsCrossroads.org. Or you can send us a tweet with hashtag ATFAQ. We would love to hear from you to know the different types of technology that you use to kind of help conversation go back and forth between a person who is able to hear and a person who isn’t. We would love to be able to hear that. BRIAN NORTON: Our next question is, I am working with a user who is totally blind and not a braille user. Does anyone know of a way to record a lecture and take notes, sort of like audio note or live scribe, that will sync the notes with the audio that is accessible? The client has a Windows PC with JAWS and an iPhone. I’ll jump in on that one. Short answer is, I don’t think there is a whole lot you can do that. Around here, we use live scribe pen, audio notes, notability, and several other products with our folks who have learning disabilities. But none of these are particularly accessible when using screen reading. BELVA SMITH: It’s supposed to be. JOSH ANDERSON: Yeah, but it’s visual. It’s a very visual. I think you can use it with a screen reader, but as far as linking the notes with the audio, it’s not going to be easy to figure out what’s going on if that makes sense. You will be able to use a screen reader to get around the screen to be able to read your notes and be able to get to the recordings. But really you can do about the same thing with a handheld recorder. It’s not going to link to anything, but you’re going to have a hard time linking those two together with a screen reader. BELVA SMITH: Yeah, for notetaking, because it will allow them to put their audio notes with their handwritten note or link them together. You can also import stuff. One note is fairly accessible with screen readers. BRIAN NORTON: I’ve used ever know a lot. I’ve never messed with one know very much. JOSH ANDERSON: I use one know a lot, but I use it on a Mac and they just added the recording feature. I haven’t had a chance to play with a lot. I think it’s been on with this for a little bit, but it is supposed to link to your notes, give you this timestamp and everything, kind of like an audio note or notability as well. But I haven’t had a really good chance to play with it. I suppose being a Microsoft product, it would probably be pretty accessible. BRIAN NORTON: Let me make sure I understand. As you type your notes into one note like regular note file, you can be recording at the same time? BRIAN NORTON: And it’s going to link to the actual notes you are taking? JOSH ANDERSON: It’s supposed to. BRIAN NORTON: That’s pretty cool. How much does one note – is that a part of Microsoft office? BRIAN NORTON: What is it with Microsoft and all the free stuff they are giving way these days? We talk about one note, seeing AI, Microsoft translator. BELVA SMITH: They are going to sock it to us at some point. I just don’t know when that is. JOSH ANDERSON: Belva, they are building their AI to slowly take over the world. BELVA SMITH: That’s what I’m saying. They are going to sock it to us at some point. WADE WINGLER: Here’s my prediction. This is from the straight business case. They want you to subscribe to office 365. They are going to give you all these little free on ramps that will eventually — to get full-featured — will have to have an office 365 subscription. These are all little doses of office 365 to get you on 365. That’s my prediction. They are building their subscription base. BELVA SMITH: I was suggest to this person that they go ahead and check out the OneNote.com because there’s more information available. Give it a try since it is free. BRIAN NORTON: I wonder if any in our audience is using it already. If someone in the audience has tried that and played with it, particularly if you use a screen reader, that would be interesting to hear your perspective on how it works and does it work well, is it still buggy or need some tweaks. That would be interesting to know. I had no idea could do that. Is pretty cool. I put down in my notes as I was looking at this question, most of the folks I work with who are blind or visually impaired, a lot of them use what, Josh you mentioned before, a digital recorder with an index button where you can mark the tape when something important is set in the classroom. They are just marking the tape. It doesn’t link that stuff. I know live scribe and notability, all those other audio notes, it’s pretty cool how does that, links to your notes. I can tell you how often I come back to my office and I look at notes I’ve taken out in a meeting, and I can’t remember what I wrote it down. Being able to click right on my notes and have it play the audio back from the time it was recorded is invaluable at times to be able to help me better understand why I thought it was important. BELVA SMITH: I think from my experience, most of the folks I’m working with, especially the students, somebody else is typing there notes for them. They may be recording them, but they are not also than trying to type them, because then they are trying, more than likely, they are listening to their screen reader while also listen to the lecture. Which is a challenge. Most of the folks I work with our using a live notetaker and then some sort of digital recorder. BELVA SMITH: If they can do it themselves, then certainly encourage it. BRIAN NORTON: Yeah. I would love to open it up to the audience. If someone is using one note — because that’s a new feature to me and I’m fascinated that they could do that — I would love to know more about that. I’ll certainly dig into it myself, but if someone has some first-hand experience with that and how that works with a screen reader, if you do use one, that would be interesting information for everybody to hear about. I want to open it up. If you do want to provide us that feedback, you can give us a call on our listener line at 317-721-7124. Or send us an email at tech@EasterSealsCrossroads.org. We would love to hear from you as well on that particular question. BRIAN NORTON: Our next question, we are going to jump into that one. It came in an email. It says, hi all, I have a student with functional use of his left hand which is likely his nondominant hand, and can use his upper right extremities to stabilize only. I’m looking for classroom tools or adaptations to promote independence for any given bilateral tasks like cutting, lacing, and other things. I spent some time on Amazon looking for one-handed this and that. There are actually quite a few things out there if you look for them. Lots of folks had some interesting information, some different types of scissors that allow for one-handed cutting. There’s a P-110 tabletop scissors. Fiskers make something called shape express. Lots of things like that. I think we’ve even found stuff from places, like Creole has some things that are made more ergonomically for folks with less dexterity and fine motor control to be able to operate. I’m guessing some of those things might work for some folks. JOSH ANDERSON: MaxiAids, Enablemart, they are always good place to look. They have a lot of UDL’s and things you can find. WADE WINGLER: I think of a couple of things. One, this need is going to be pretty common in aging populations as well. If you think about people who are older who have had a stroke and are into sewing and crafts and those kinds of things, I don’t know what the market looks like for that kind of stuff, but I am sure there are a lot of folks who are using one-handed approaches for arts and crafts. I would think that a lot of that would translate over into the classroom. The other thing is this is square-on Occupational Therapy. This is where OT’s live and breathe and do their work. I don’t know if our person asking the question is an OT, but definitely needs to reach out to an OT in that school setting because they do this stuff all the time. BRIAN NORTON: Right. I also wanted to mention an interesting accommodation we had before for a clothing designer. This person had osteogenesis imperfecta, which means you have very short extremities. She was wanting to be a clothing designer. We ended up working with her, getting a drafting table. A drafting table can be tilted at a 45 degree angle. We work with a machine shop. We actually have an industrial services piece of our deal here at Easter Seals Crossroads. I worked with them, and they cut some metal sheeting to be able to fit the top of that particular desk. We covered that metal sheeting with felt and got some pretty high-powered magnets that would be able to hold clothing up on it. We got a one-handed pair of scissors, and electric pair of scissors she could use. We also got her a dressing stick. The dressing stick is a long wooden dowel with a couple of folks on the end that allows you to do things like zipper pulls and other things. But for her, it was really interesting. When she had those magnets, she could move those magnets around and hold that clothing really tight for fine cuts and things like that as she was using it. We also work with a company who designed a switch adapted sewing machine which was unique in that the switch needed to be a progressive switch. It was not a simple on or off. Essentially with sewing machines, the harder you push, the faster the machine goes. The lighter you push, the slower goes. They designed a switch that would allow her to be able to position that switch by her hand so she could run it with one hand as she tried to feed the clothing through the sewing machine. It worked pretty well for her. Just interesting things that were a little bit out of the box, not necessarily designed for what she was necessarily looking to do, but we kind of pulled all those things together and made a pretty interesting accommodation. It worked out fairly well for her. Just thinking about those kinds of things. I think in a situation, a lot of times you’re going to have to think outside of the box about doing this or that. Sometimes you may not find a tool that specifically it’s the need. Thinking about all the way to make that happen and looking for that accommodation. BELVA SMITH: One of the things she has on her question is lacing. I would assume we are talking about lacing a shoe or something like that. There, you are probably trying to think of something that is going to grip the object you are trying to get laced. May be something as simple as the shelf liner. I’ve used that in several situations to help stuff not slide around on the table. That’s a fairly an expensive, just whatever size you need to cut as you need it. BRIAN NORTON: That’s funny. I didn’t think about lacing like that. I thought about lace like a doily. WADE WINGLER: That’s the art of tatting. BRIAN NORTON: Tatting? I thought that was tattoos. WADE WINGLER: That’s also an art involving needles. But tatting is the art of making that kind of lace. BRIAN NORTON: That’s really cool. I had something else in my mind. JOSH ANDERSON: You just made that up. WADE WINGLER: It’s part of the universe a very useless information floating around in my brain. BRIAN NORTON: I love it. Let us know. If you guys have run into some of the situations, if we have any teachers who are listening, special educators who are listening and have has students who needed certain things for the classroom to operate in two different types of our projects one-handed, we would love to hear from you and know what those things are to pass them along on the show. You can reach out to us at our email address, tech@EasterSealsCrossroads.org. You can send us a tweet with hashtag ATFAQ. Or send us a voicemail at 317-721-7124. [37:47] Wildcard question: What are you doing with all your old pictures? BRIAN NORTON: We are running low on time today. We had taken some time with questions. I want to jump into our wildcard question. This is where Wade gives us a question that we haven’t prepared for at all. What have you got for us today? WADE WINGLER: I’m trying to create a frequently asked question. I’m going to ask the same wildcard question every show. BRIAN NORTON: I like that. WADE WINGLER: I got a thing in the mail this week from a cousin of mine. She had been going through an old box of photos, and she found a whole bunch of precious photos of my parents and me when I was a kid at family gatherings and stuff like that. She goes, hey, we are just sorting through all this stuff because going to my mom’s things. Without you would like to have these. It was really nice and great. It reminded me that I got about four five of those boxes in stores that I need to go through and all that kind of stuff. My kids, who are five and seven, were completely fascinated with these actual photographs of times gone by for them. It occurred to me that they aren’t going to have that experience of old photos or boxes of photos. It’s all digital photography. I can’t tell you the last time I took a photograph and it ended up on a piece of paper. What are you guys using for your digital photography in your storage of those pictures? Right now, for me, I’m a Facebook user. I get the Facebook memories that pop up, and I was like oh that’s a good memory from four years ago and I have a little heart moment and move on. I realized that that is entirely dependent upon Facebook surviving and continued to do that. What are you guys doing about digital photo so that whatever future equivalent of the box in the garage of all the old pictures is going to be preserved? Or is that just going away? Is that a thing of the past? Are we not going to have digital photos that we do have? We all try that and think we are going to do it, but are we really doing it? What are you doing? BELVA SMITH: My fear is what is going to let us view those digital pictures in the future? I’m using — we’ve talked about this before — the iExpand Base, so when I get home every day, first thing I do is plug in my phone in. It backs up all my notes, my contacts, and my pictures. So I have them on an ST card. Now I can take the ST card and go to Meijer, Walmart, or computer and print a picture if I choose to. But my fear is, because 15 to 20 years ago when my kids were little, I had the big — I’m saying 20 years. I’m going to say more like — we want to but that. I had the big camera that I carried around at all the football and baseball games to record them. Now, I don’t even have a VHS player in my house. BELVA SMITH: My fear is what is going to happen to all these digital? Are we going to have a device that will allow us to access them in the future? Just to go off of what you said, Wade, I remember as a little girl sitting on my great grandmother’s house. She had little baskets of photos. Even though I didn’t know who have the people were, I just loved sitting for hours and going through all those photos. I do think photos are important, and I don’t think we are printing them like we used to. But I love digital photography because it allows us to capture so many more memories. I’m just not sure what we are going to do if we can’t access them in the future. BRIAN NORTON: I use my phone to take pictures, and they stay on my phone. That’s where they live. BELVA SMITH: You don’t have them backed up anywhere? BRIAN NORTON: I don’t. We talk about it and talk about it. One of these days, we are going to get those backed up. BELVA SMITH: Are you an Amazon prime number? I also have mine backed up at Amazon prime. That’s free. BRIAN NORTON: We are on Amazon prime. BELVA SMITH: You can use their backup. BRIAN NORTON: We just never get around to it. We talk about how important it is and we really want to do it, but do we ever do it? No. I don’t know. I will say, we do print periodically I pictures. We still go to Cosco or a story around here and we will print those out, the ones we really want, especially if we are going to share them with folks or want to fill some picture frames a home. But yeah, it’s a problem at our house. We had lots of people taking pictures and they are not backed up. They are either on the Instagram Story, Instagram feed, or Facebook feed is where most of our pictures live if we are ever going to go back to them. I think it’s gone too easy. We all snap features of 150 things a day. 75 of them, you never want anymore. I think this is going to be really important. WADE WINGLER: But once you post them to MySpace, they’ll be there forever, right? JOSH ANDERSON: Kind of like what Belva does, but most of mine are on a hard drive at home, most of my old ones. Newer ones are on the computer and on the phone. But we do print out a decent amount of them for little stuff. We use Shutterfly to make neat little stuff. Printing is a lot easier because you can — we use Walgreens. It’s super easy. You can upload your photos and keeper photos on their server if you want to and just print them out whenever you want. It’s nice. I do still have all my grandmother’s photo albums. BELVA SMITH: You have them? That’s awesome. BRIAN NORTON: I have all our old stuff. BELVA SMITH: That’s awesome because, a story like yours, Wade. About three years ago, my cousin context to me and said I was going to mom’s photos, and I found a picture of you when you were little. I have no pictures from my childhood, none, not a one. They sent me that picture and it meant everything to me because that’s the only photo I have of myself. Funny thing is I remember it because I always sat on my great grandmother’s table. WADE WINGLER: You have to bring it here. I want to see a picture of two-year-old Belva. BELVA SMITH: I think I have it on my phone. BRIAN NORTON: Wade, what do you do with yours? WADE WINGLER: We are backing them up to dropbox. I have a thing set up so that they are going to dropbox. I’ve also set up a shared dropbox so that me, myself, my sister — I have only one sibling — all have access to the same shared photos. We are dividing up — and we started this process and stopped when the weather got nice. She’ll take a box of pictures, I’ll take a box of pictures, and we both use an app. I forget what it’s called. It does a nice job of rapid the scanning them in from your picture to the phone straight into dropbox. I’ve been scanning and she’s been sorting them into things like family gatherings and folders with the names of the people who are in them. It’s the same thing that you said, Brian. We had this process, something in place, but we haven’t really gotten around to doing it. We’ve done may be a couple of hundred photos and there are thousands of photos that need to be scanned. BELVA SMITH: I think the Google photos, you can search. You can say pull up all the pictures of Brian or all the pictures of my dog. BRIAN NORTON: I get a little nervous. I have a work phone, and sometimes I’m out with a client, I have to take is that picture of something. I don’t want something like an If This Then That, and throws it out onto Google drive or dropbox. I want to have some sort of way to control that. I had to work on it. Like I said 100 other times, I have to work on the process. WADE WINGLER: The app I’m using is Pic Scanner Gold. I want to say it was a six dollar app. There is the picture of a two-year-old Belva! That’s precious. BRIAN NORTON: You look like Madeleine. WADE WINGLER: That’s awesome. This app is cool because I can take five or six photographs, put them on the kitchen table, hold the camera over it once. It will take a picture of all of the photographs and then sort them out and allow me to crop each one so I can do five pictures and then crop them and put them in. It really does speed up the process of taking all those old pictures and getting them digitized. WADE WINGLER: That’s exactly what mine. My VHS to DVD converter is sitting on top of the box of VHS’s. BELVA SMITH: I’m going to do that someday. BRIAN NORTON: I still have my combo, my DVD-VCR combo. I’m just hoping that lasts forever. WADE WINGLER: So you want little mermaid on VHS. BRIAN NORTON: Absolutely. That’s our show for today. As you guys have listened to our show, you listen to the questions we’ve asked, if you guys have any feedback, we would love to hear from you. If you are thinking of questions you have and what to send them to us, we would love to hear from you as well. You can send us a voicemail at 317-721-5124. You can send us a tweet with the hashtag ATFAQ. Or you can email us at tech@EasterSealsCrossroads.org. We want your questions. In fact, we need your questions. We love your feedback as well. Be a part of our show. We would love to hear from you.